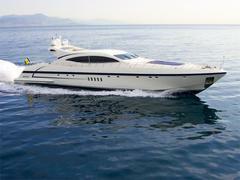 More news from Peter Bennett of Blue Water Yachting as he signs the central agency for sale of Mangusta's 33m Les. Delivered by Overmarine in 2008, her twin MTU waterjets can reach speeds of up to 35 knots and she has a variety of thoroughly modern features, including state-of-the-art audio/visual equipment. Sleeping eight guests in four luxurious staterooms, Les is being marketed at €12.95 million.